I believe you should regularly get out of your comfort zone and challenge yourself. I’m not always great at practising what I preach, but I’m happy to report that I completed my first road cycling team time trial over the weekend. For a lot of riders that would have been well within their comfort zone but for me it was a stretch. Not a huge one, but still a stretch. Apparently there’s some science behind the concept. The ‘comfort zone’ is described as the behavioural space where your activities and behaviours fit a routine and pattern that minimises stress and risk. It provides a state of mental security. In order to maximise performance, however, we need a state of relative anxiety — a space where our stress levels are slightly higher than normal. This space is called “Optimal Anxiety”, and it’s just outside our comfort zone. Too much anxiety, and we’re too stressed to be productive, and our performance drops off sharply. So I guess my weekend experience was in that optimal anxiety area. For me the opportunity to stretch myself came from my cycling club LACC. Our club has been successful in recruiting quite a few new female members in the past six months or so, thanks mainly to the efforts of my friend Jane and me. 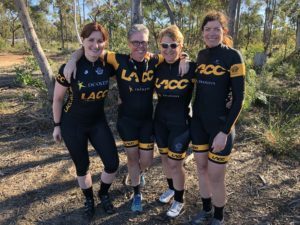 Jane came up with the idea of encouraging many of these new women to enter the annual club Team Time Trial (TTT). So I decided to go along to the first training session to show my support. At this stage, about six weeks out, I had no intention of actually joining one of the teams. I’d tried a little bit of a racing three or four years ago and decided it wasn’t really my thing. As the weeks progressed I went along to a couple more training sessions, and as we got closer to the team selection part, I rather quietly said that I would join a team if they needed me to make up the numbers. Hardly enthusiastic!! We ended up with 11 riders, and of course we needed 12, so I was recruited. We then chose the teams, something I had a hand in and that was it. I couldn’t back out now. We trained a bit more but all agreed that our main goal in participating was to ride as a team and enjoy the experience. As the day drew closer and I confessed to my team mates, Sharon, Claire & Vanessa that my greatest fear was that “I’ll ride like a slug and slow everyone down”. They all assured me that they weren’t in it to break records but to enjoy themselves. That didn’t stop me being stressed in the days leading up to it. So the day arrived and I took to the start line feeling a little nauseous but knowing I had the full support of my team. And of course it all went well. We didn’t ride as hard as really serious TTT riders but we pushed ourselves and completed the course in a respectable time. But more than anything we’d ridden as a team the whole way and crossed the finish line together. Job done, comfort zone pushed. It will make you more productive – comfort kills productivity because without the sense of unease that comes from having deadlines and expectations we tend to do the minimum required to get by. We lose the drive and ambition to do more and learn new things. You’ll have an easier time dealing with new and unexpected changes – one of the worst things we can do is pretend fear and uncertainty don’t exist. By taking risks in a controlled fashion and challenging yourself to things you normally wouldn’t do, you can experience some of that uncertainty in a controlled, manageable environment. Learning to live outside your comfort zone when you choose to can prepare you for life changes that force you out of it. You’ll find it easier to push your boundaries in the future – once you start stepping out of your comfort zone, it gets easier over time. As you step out of your comfort zone, you’ll become accustomed to that state of optimal anxiety. Share your experiences where you’ve had to get out of your comfort zone, via comments or the Women Who Cycle Facebook page.